Operating room surgical booms are a complicated muddle when it comes to trying to understand the differences between what the supply management manufacturers have to offer. A lot of what is the best fit for you depends on what your needs are. For example, if you’re a smaller surgical centre, you probably won’t need the heavy duty boom arms that hold in excess of 500 lbs. That being said, there are, however, functional differences that could prove to be the game changer in your purchasing decision when pricing out booms. Having installed more than our share of surgical boom equipment in Canadian hospitals and private surgery centres, we know a thing or two about what boom suppliers offer. In this article, we will cover off a review of the main operating room boom suppliers in Canada with factual and public information. It is our goal to eliminate any type of “promotional” language, such as “outstanding flexibility”, “ergonomic management”, “streamlining workflows”, etc. NOTE: Since surgical booms can be a very biased topic, we are only including the manufacturers that are listed in the independent study “Surgical Booms Market Global Insights and Trends to 2022”. This includes features, benefits and technical specifications. Our goal is to make sure that you have all the information you need in order to make a decision that will best benefit your facility. Amico has three boom options. 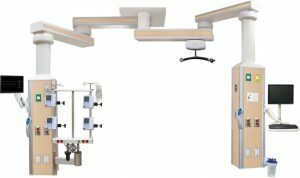 The Spectra Series can also be configured with a patient lift pendant. To maneuver the pendants, there is an electric brake handle mounted onto the service console. Eight integrated equipment rails, located on each console, allow the user to choose various accessories to attach to the pendant system. Available in single or dual mounts, as well as single or dual arms, the Spectra Series is customizable with features such as colour, gases, console sizes, accessories, and outlets. Pendants are available in 20” to 60” sizes. The Saturn Series, with dual electric/friction braking, has fully customizable consoles with MedGas, lighting, electrical and data outlets, and accessories. 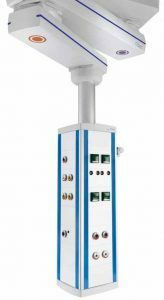 Directly connected to the ceiling, the Saturn Series offers customizations for the outlets, console size, gases, colour and accessories. Amico pendant sizes go from 20” to 60”. 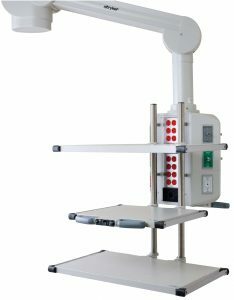 The OR Equipment Pendant features adjustable shelves that are capable of holding up to 150 lbs each. 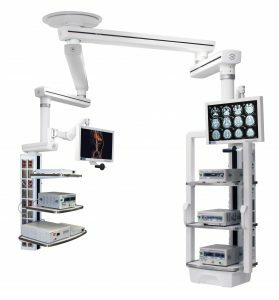 With customizable console sizing and MedGas outlet placement, the end users can modify the consoles with numerous accessories using front and back equipment rails. Maquet, a part of the Getinge Group, offers the MODUEVO ceiling supply units. The outer design of this system aims to reduce the risk of nosocomial infections with smooth surfacing. With its unique central tandem mount, Skytron Ergon 3 booms can hold up to four arms on one mount. No other boom system can accomplish this. Skytron booms are reputably the “lowest cost of ownership”, as the central tandem mount eliminates the need for additional construction, and the booms are designed for less maintenance (i.e. braking system). With a compact design, Steris’s HarmonyAIR® Surgical Booms offer a maximum weight capacity of 450 lbs. 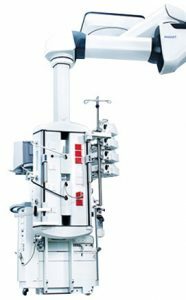 With its modular design, Stryker’s FLEXiS allows for customization and flexibility in positioning shelves and other accessories. 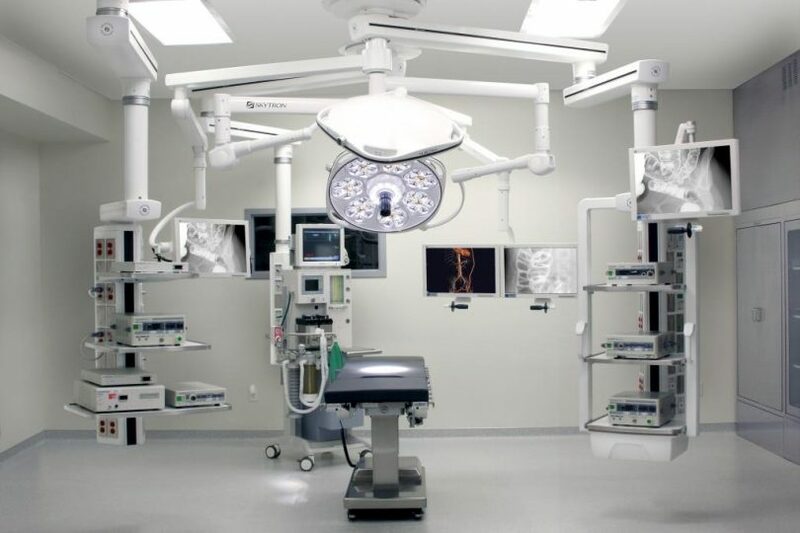 Trumpf Medical’s ceiling-mounted supply units offer a modular design that can be customized and future proofed for other accessories down the road. As we mentioned at the beginning of this article, booms can be a very biased subject. Whereas one system may be better for Scenario A, it doesn’t mean that the people in Scenario B will have the same preferences. There’s no question that booms are a major cost, and as such it’s important to look at the lifetime cost in addition to the initial cost (i.e. having an expensive car is great, but if you can’t afford the gas, you’re not going anywhere). To make planning your operating room boom system easier, we’ve complied the Ergon 3 brochure and accessory brochure into one document for you to download. *Please note that we only offer Skytron booms in Western Canada at this time.